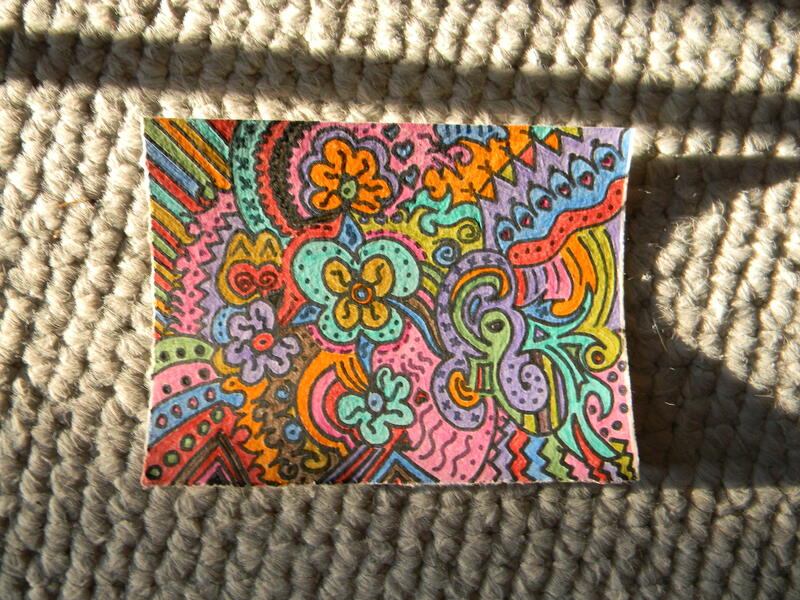 I like to doodle. I doodle when I’m on the phone, when I’m waiting for things, especially when I’ve been in long training sessions or staff meetings in the office. It’s a form of listening for me. If I doodle I can listen and pay attention better. I don’t start reading labels or handouts or whatever I can get my eyes on. My mind doesn’t wander away. My doodles are somewhat aimless and very stream of consciousness. I have no particular plan when I start and I generally won’t stop until I’ve filled up the space. Many times I will date them and save them because I particularly like one or sometimes they inadvertantly get saved in my notes and I run across them later. In the past couple of years I’ve been embracing my creative bent and mixed media art and learning lots of techniques. I’ve recognized that my doodles can be used in my mixed media creations. I have been experimenting with coloring them with various mediums. The one above I doodled with a Copic marker and then colored with colored pencils. I am a fan of several artists who use a lot of happy colors and images and at times some colorful language! I adore them. These people inspire me in so many ways; their art, their knowledge; their fearless creativity; their wonderful big personalities and most certainly their boundless energy! I aspire to be just like them when I grow up in my artistic endeavors. One of my favorite artists is a wonderful woman named Joanne Sharp ( http://joannezsharpe.blogspot.com/). I have admired her gorgeous spirited work even before I knew her name. I would see it in publications and instantly be drawn to it. I had the great pleasure of meeting her in person this summer and getting to know her a bit. Her work is endlessly colorful and squiggly and lighthearted. It is inspiration I get from her that made me think I should try colorizing my doodles. Enjoy! I love your doodle. Keep going!